On one of the ‘Camp King Open House’ events, I ran into Lale, whom I had met in 1998, when both our sons were at the same kindergarten. At the time of the event, she told me of her employment at Camp King in the 90s. So this is her little story about how she got the job and what working there meant for civilians. Q: You have German and American citizenship, I assume. Was it easier getting a job in Camp King with an American passport? A: Actually, I only have American citizenship, because dual citizenship for Germany and the USA was not possible then (*Lale was born on U.S. soil, so the U.S. Government does not recognize dual citizenship with Germany). When we moved to Germany, my stepfather took a job with the army in Offenbach, and that’s how we got an ID card with privileges. When he returned to the USA in 1981, we had to turn in our ID cards. We were still able to enter the the military camp as long as another soldier would sign us in. We had to present our passports, nevertheless. Q: When and in what position did you work at Camp King? 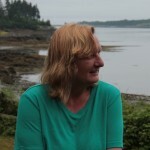 A: I was part of the cleaning staff for the military base. My favorite place to work was the gym. I was even once nominated “Employee of the Month” (Lale added, “a thorough cleaning goes a long way”, while laughing). This award made me proud in the sense of my work being appreciated. Once I was even asked to clean the top-secret underground offices. I only cleared the bins in the company of an MP. We had to leave the building immediately after that. I can’t quite remember how long I worked there. It was only a temporary solution until I could find permanent employment. I worked there sometime in 1984. Q: During your time at Camp King in 1984, what are your most memorable moments? A: Oh, the fun times we had (snickering). At the former Disco ‘La Soiree’ in the Vorstadt (today: Bärenarkaden shopping center), we used to party and sometimes went back to the base to party a little bit more. Ela’s Stübchen was also a popular spot. A lot of friendships developed during that time, some in a romantic way. Years later, in the early 90s… there was one scary moment when I saw G.I.s walking the Camp King fence with their machine pistols. This could have been the time of the Kosovo war. The soldiers, usually always friendly, were under some stress during that time. I tried to stay away from that fence as far as possible on my way to the then nearest U-Bahn station ‘Kupferhammerweg’. It must have been during that time that leaving camp became more restricted – no entry between 2 – 5am. Some went out nevertheless and then we just partied till 5am, when the gates opened again. 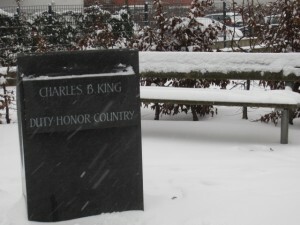 Q: In those years you mentioned, 1984 to early 90s, did you live close to Camp King? Did you hear the daily reveille calls? Some German neighbors found this annoying. A: Unfortunately, I can’t remember this. Our apartment was facing the Feldberg Mountain, and so it was relatively quiet. But I do remember loudspeakers all over the camp. There were also announcements made throughout the day, but I can’t remember about what. Q: You had mentioned a plain building near the tennis courts? Was this a special place? A: Right between the tennis courts and the motor park, there was this square building, made of cement, and I believe it housed the computer server and all the equipment. Once I had to cover my colleague’s shift and my task was to clean the bins and this had to be carried out in the presence of a civil servant. Thanks, Lale, for sharing this with us. Ela’s Stübchen in the Henchenstraße has been closed for a few years. I was there once, it might have been 2010, and then it was called the Schnitzel Haus by some friends. On this drizzly Christmas Day, we took a little walk around the neighborhood while disposing of all the paper trash, mostly gift wrap from last night’s Christmas celebration. In Germany, we celebrate and do the gift exchange on 24 December. If I remember correctly, most of the apartments at the Mountain Lodge have been sold already. During yesterday’s opening ceremonies of the Camp King History Depot, a present was given to Mr. Kuhn, a member of the investor group who had purchased the Mountain Lodge a while back. 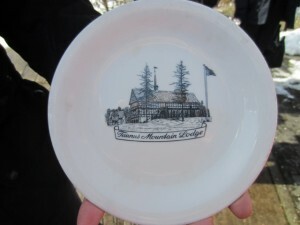 A plate, depicting the Mountain Lodge, used to be given to departing U.S. military personnel as a farewell present. Update: An article from the Taunus Zeitung mentioned the ongoing renovation at the Mountain Lodge. By the end of 2013, eleven apartments are supposed to be ready for sale. The sale has not started yet, but inquiries are already coming in. I’d be interested too, but real estate prices for new houses and apartments in Oberursel have risen quite a bit, and still continue to do so. It has been snowing here since early this morning and the city’s snow removal service people are quite busy and so are the young ones, taking advantage of this heavy snow fall. I took a short walk through Camp King towards the Mountain Lodge where we usually find a sledding trail. Not today though. 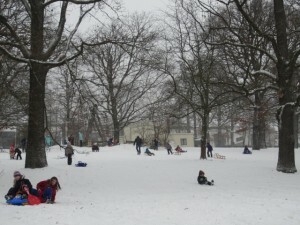 Today’s sledders were all using the hill in front of the chapel (yellowish building in the center). 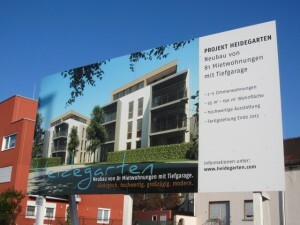 These two housing developments are currently built in Oberursel. with more than 80 apartments, ranging from one-bedroom to four-bedroom apartments (some in penthouse style). A few apartments on the ground floor are also suitable for commercial use. For more information, visit Oberursel Heidegarten (in German). The grounds of the former Janndorf factory have been cleared to make room for 130 apartments and houses. This is in a convenient location as the U-Bahn station is in front, Frankfurt International School (FIS) is in walking distance, and a supermarket, schools, kindergarten, etc. are just across the street. 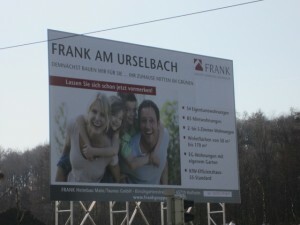 For more information, visit Frank Am Urselbach (in German). 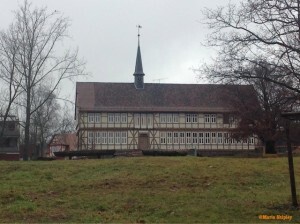 Oberursel is a popular place to live. 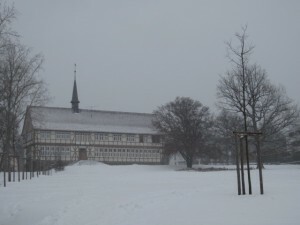 Other recent housing developments are: Camp King (2000), Ober den Birken (2006), and near the Forsthausweg – Tierheim (2008).